The state Senate voted Tuesday to ban the sale of foam food and beverage containers. If the measure passes the House, Maryland would be the first state to pass a statewide ban on the products. The ban covers expanded polystyrene cups, plates, takeout containers and egg cartons. When Barbara Johnson, a water quality scientist with Blue Water Baltimore, makes her way down the Jones Falls for her monthly water quality check, she doesn’t see much in the way of trash. That is until she checks Roland Run, a tributary of the Jones Falls, just north of Lake Roland. “You see your plastic bottles, plastic bags, and styrofoam,” Johnson said. Thousands of people make their way on the Jones Falls Expressway each day. But running beneath the JFX, there’s the other Jones Falls, the waterway people talk about usually only when it floods, or is flooded with raw sewage, or both. Officials are grappling with how to control and improve the Jones Falls as it makes its way from Baltimore County to the Inner Harbor. A bill introduced in the Baltimore City Council Monday night would prohibit the expansion of the city's two crude oil terminals, and forbid the building of new ones. Maryland Attorney General Brian Frosh filed a lawsuit Wednesday against the Environmental Protection Agency. 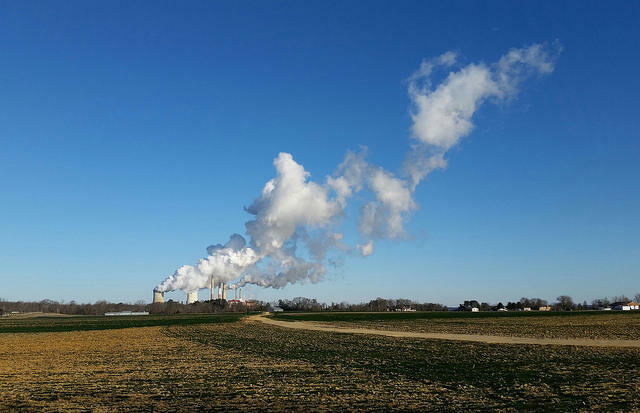 State officials say the EPA is not enforcing the Clean Air Act in five upwind states, and that creates an unhealthy level of smog in Maryland, particularly in the Washington and Baltimore metro areas. State lawmakers plan to introduce legislation requiring the state to get all of its electricity from renewable sources, such as wind and solar, by the year 2035. The bill is expected to be introduced when the General Assembly returns to Annapolis in January. Gov. Larry Hogan’s administration warned the Environmental Protection Agency on Thursday that it will sue if the federal agency does not stop coal-fired power plants in Indiana, Kentucky, Ohio, Pennsylvania and West Virginia from contributing pollution to Maryland’s air. The Baltimore City Council has approved a resolution upholding the Paris Climate Accord -- an agreement President Trump backed the US out of earlier this month. WYPR's Dominique Maria Bonessi shares the details with Nathan Sterner. Senate President Mike Miller opened debate Monday on a bill banning hydraulic fracturing, or fracking, with gusto. The Senate’s debate and subsequent approval of the ban came just over a week after Gov. Larry Hogan’s announcement that he supports banning the controversial drilling practice. If Maryland lawmakers want to pass a fracking ban during the General Assembly’s current session, they need to get it past Baltimore Sen. Joan Carter Conway, chairman of the Senate committee that oversees environmental legislation. And as Conway told a room full of environmental activists in Annapolis on Thursday, that that’s not likely. A green lawn is as American as apple pie, and for many of us, just as comforting. But as more people move to urban areas, lawns and other manicured spaces are beginning to dominate the landscape. Lawns already cover more land in the United States than any other irrigated crop, and a lawn in Phoenix looks much like a lawn in Boston. Why do we love lawns so? How do they impact the environment? And what could we do differently? Soil scientist and urban ecologist Peter Groffman joins us to discuss. Groffman has studied the ecology of Baltimore and other cities for decades, including their lawns. Back in the 80s, the Environmental Protection Agency began requiring power companies to install "scrubbers" in the smokestacks of their coal fired plants to capture pollutants before they got into the air. And that did a reasonable job of cleaning up the air we breathe. But it damaged the water we drink because all that lead and arsenic and selenium trapped in the smokestacks had to go somewhere. It went, unregulated, into thousands of miles of rivers and streams, making power plants the worst water polluters in the nation.